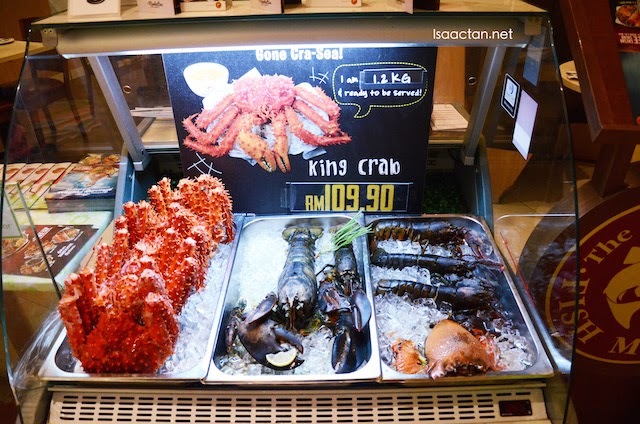 Did you know The Manhattan Fish Market Pavilion KL has started serving King Crabs on their menu? Well I did not know, not until I had the chance to dine there last week with a couple of friends and foodies. 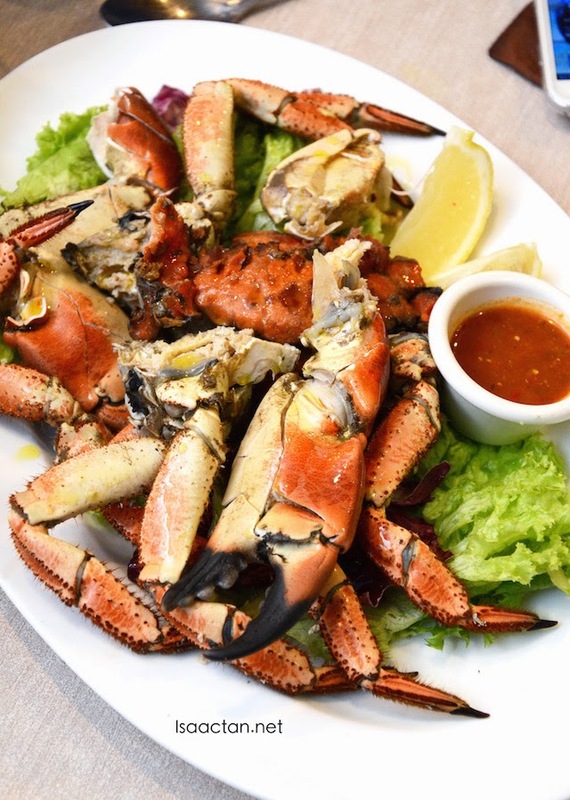 The king crabs were available for a limited time only, so in conjunction with their launch of 43 new innovative selection of dishes, we got to bite into some scrumptious crabs. With the evolving palettes and preferences of diners in mind, the restaurant pushes the envelope of culinary creativity to develop an extensive spread and pull togethers a feast of New and Bolder flavours. An interesting new dish on the menu, Fishy Chicky Bang Bang came with a rather unique name. It's a combination of fish and chicken on a platter. 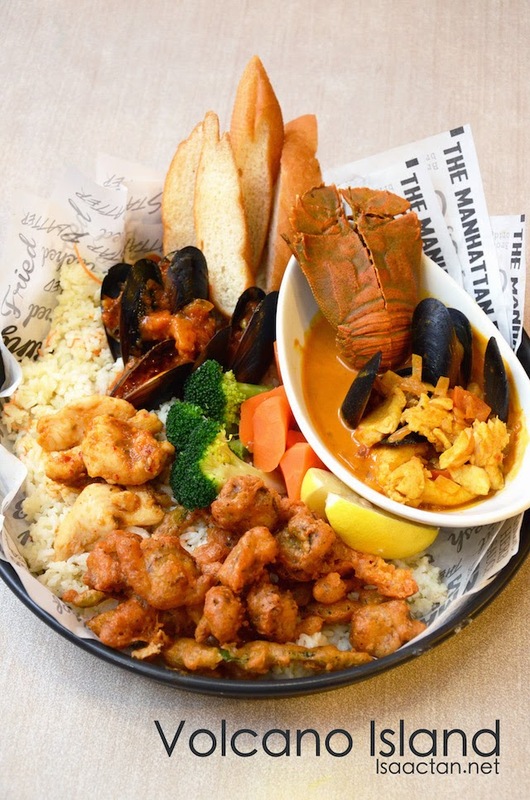 For the very first time at Manhattan Fish Market, we get to enjoy Surf'n Turd in a single bite with dory fillet on one side and chicken fillet on the other. In between we have sinfully yummy cheddar cheese. Served with a sunny side up nestled on a bed of fried spaghetti together with house salad and chips, I don't mind having this to share with friends. After a quick round of Oyster Roulette, one which I did not partake in, as I'm not very fond of oysters, we were served with this huge platter named the Volcano Island. Meant to be shared, the Volcano Island came in two versions, one with Slipper Platters, and one with Prawns. Served with Murray Curry, it was a mix of fried scallops, poached spicy dory nuggets, volcano mussels, and slices of crispy baguette on a fragrant bed of Garlic Herb rice. 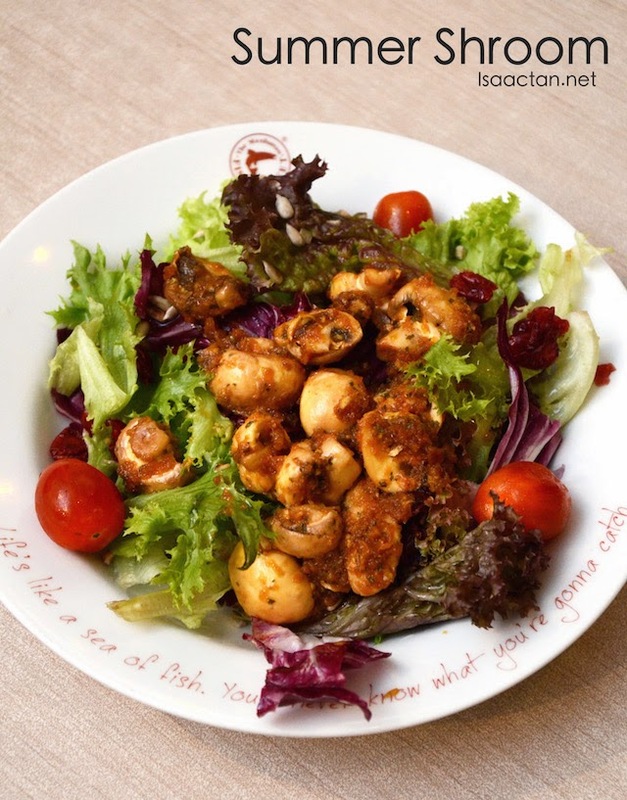 For mushroom lovers, do try out their Summer Shrooms, consisting of marinated button mushrooms and cherry tomatoes, topped with roasted sunflower seeds and cranberries on a bed of salad. I took a huge interest in the Fried Giant Sharing Platter. 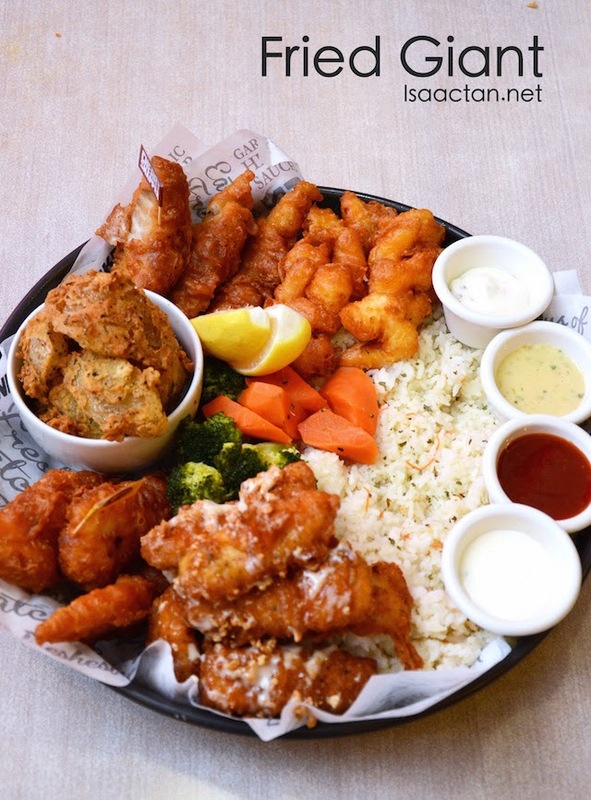 A huge platter filled with crunchy prawns, crispy fish fingers, cherry snapper fillet, battered onion strips and calamari coated with crushed peanuts, you can't finish it alone, trust me. Not a really new dish, but one of the crowd favourite, the Grilled Glory Dory is one of the recommended dish here. 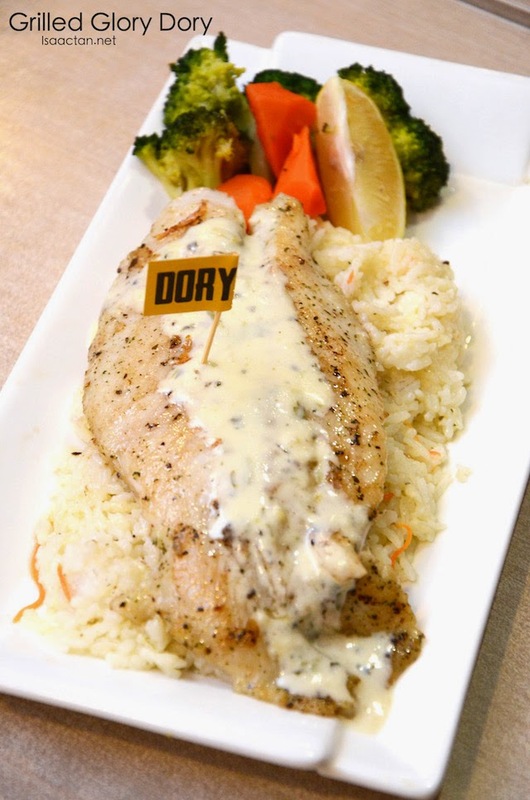 With fragrant garlic herb sauce on top, I must say I like the 'not too oily' taste of the dory fish in this delicious dish. 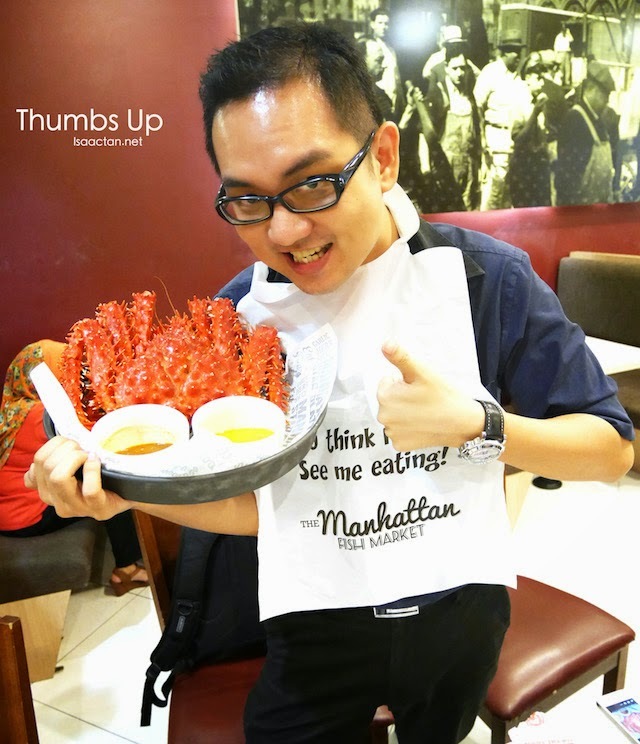 Up next are the limited time offer crab dishes, available on at Manhattan Fish Market Pavilion and Ampang Park. Check them out below. 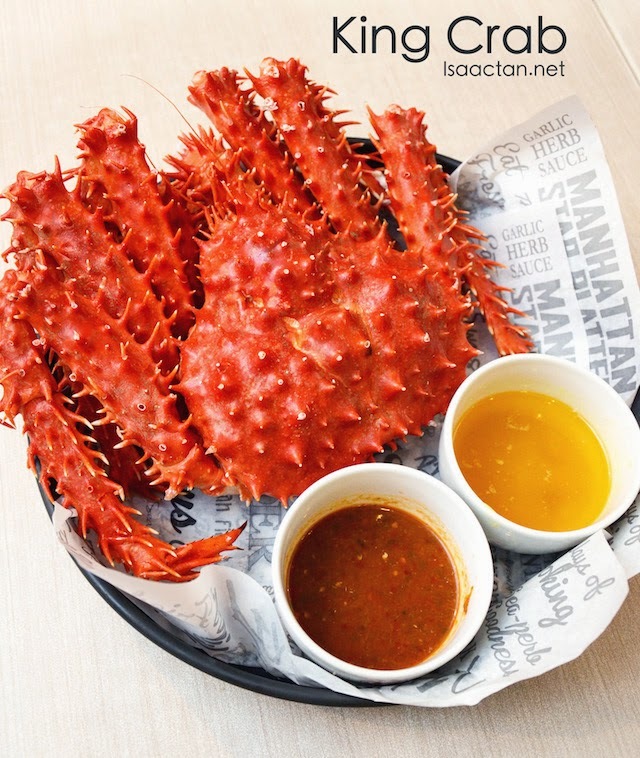 With limited stock available, it was no wonder that every other table at Manhattan Fish Market Pavilion that night ordered the King Crab. Priced at a very low RM109.90, it was a steal. Poached and served all cut up ready to be eaten with friends and family, I don't see any reason why you shouldn't rush to Pavilion now to savor their King Crabs. 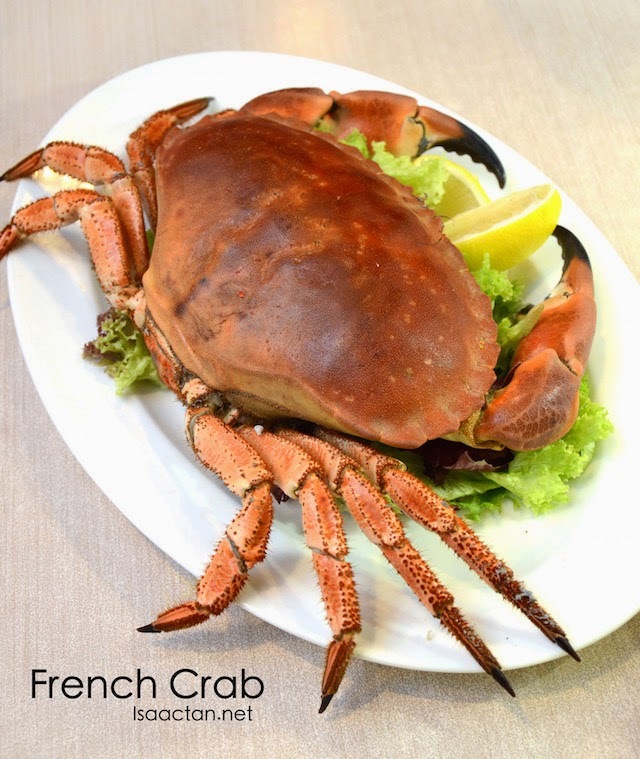 If you want some variety, MFM serves two other types of crabs, namely the Australian Spanner Crab shown above and the French Crab which will be shown subsequently below. 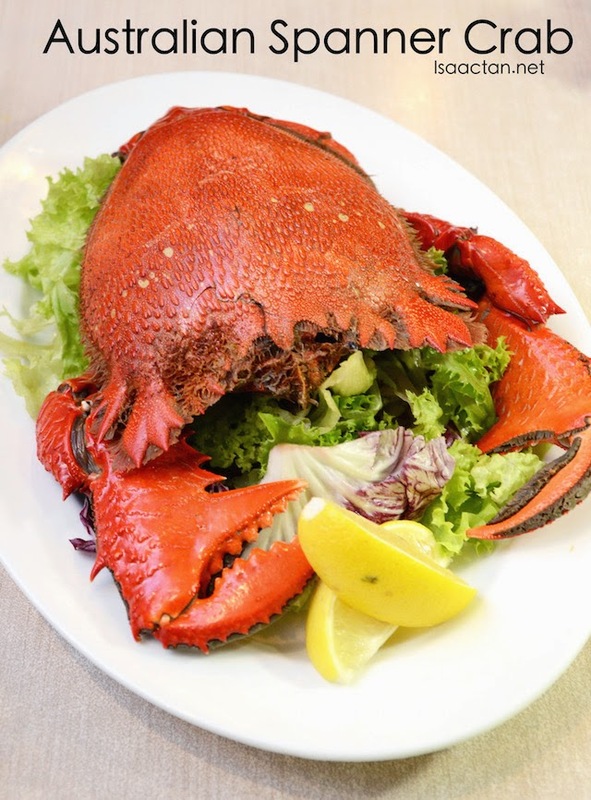 I like the fact the staff from the restaurant take the effort to cut open the shells, and claws ensuring you do not need to waste any energy trying to break it open, and fully focus on enjoying the meat inside. Good stuff. It was rather unfortunate I'm not a very big crab fan, but I did have a couple of bites, and they were pretty good. 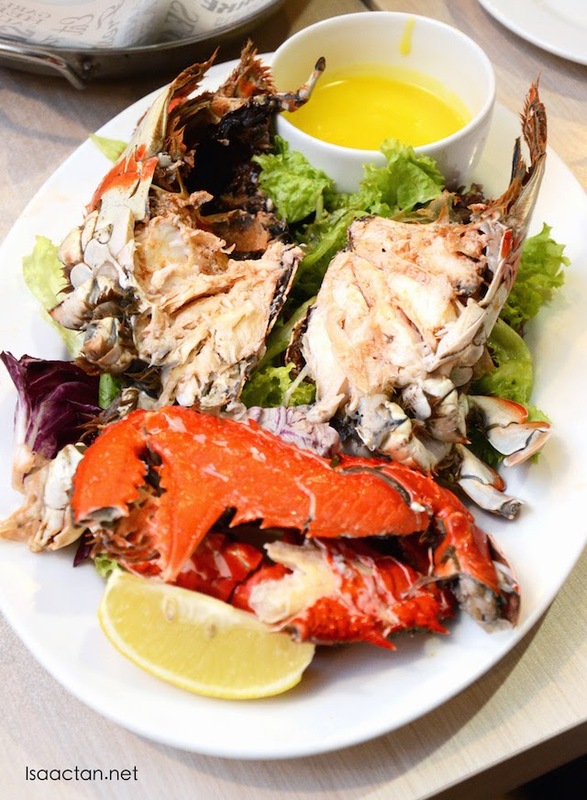 For crab lovers, these dishes are heaven sent, as they did not hold back on the size nor flavours. 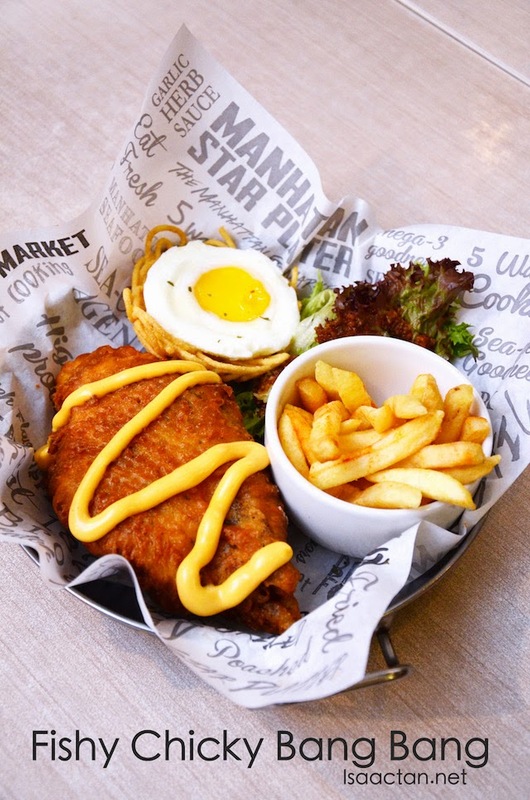 Do check out Manhattan Fish Market at any of their many branches across Malaysia. 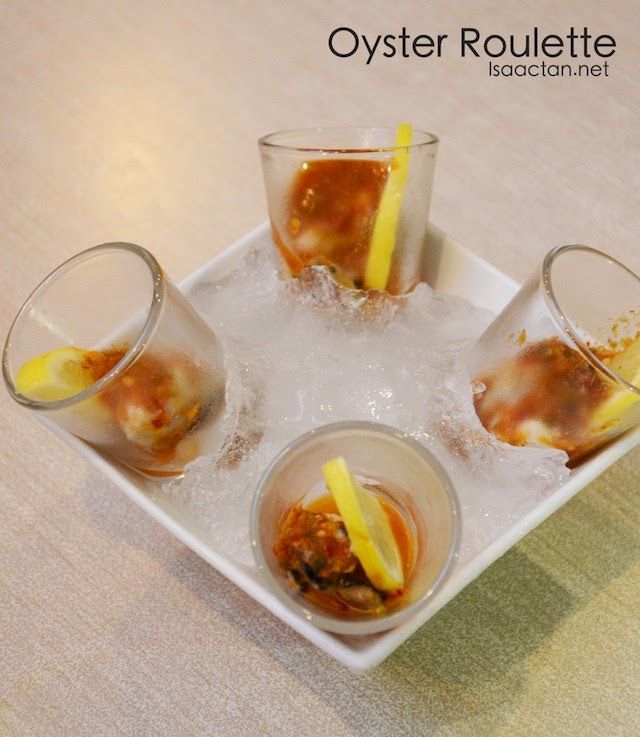 For more details on The Manhattan Fish Market's latest promotions or catering services, do check out their website at www.manhattanfishmarket.com, FB at www.facebook.com/MFM.my or call directly at 03-79571118. Nice menu! It's been awhile since I visited the Manhattan Fish Mart in SG. wei bojio and now i see aladi hungry la.